The London Merchant by George Lillo, directed by Peter Dobbins at the Theatre of the Church of Notre Dame; reviewed by Daniel Gustafson. Cardenio by William Shakespeare and John Fletcher, re-imagined and directed by Gregory Doran at the Swan Theatre; reviewed by Brean S. Hammond. The Marriage of Figaro by Wolfgang Amadeus Mozart, Directed by David Gately at the Ellie Caulkins Opera House; reviewed by Jennie Macdonald. Entertaining Crisis in the Atlantic Imperium, 1770-1790, by Daniel O’Quinn. Reviewed by Joseph Roach. The Works of William Congreve, edited by D. F. McKenzie. Reviewed by Brian Corman. London, curated by Gill Perry and Lucy Peltz; The First Actresses: Nell Gwyn to Sarah Siddons, by Gill Perry, Joseph Roach, and Shearer West; Thomas Betterton: The Greatest Actor of the Restoration Stage, by David Roberts. Reviewed by Jessica Munns. 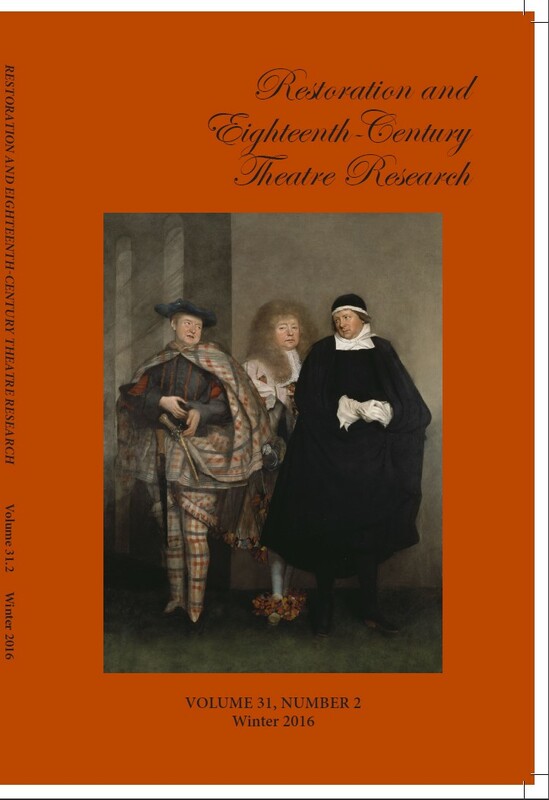 Pamela Allen Brown and Peter Parolin; Women on the Stage in Early Modern France, 1540-1750, by Virginia Scott. Reviewed by Penny Richards. A Short History of Celebrity, by Fred Inglis; Fashioning Celebrity: Eighteenth-Century British Actresses and Strategies for Image Making, by Laura Engel. Reviewed by Brian Bates. Licensing Act, edited by Catie Gill. Reviewed by Al Coppola. Moral Reform in Comedy and Culture, 1696-1747, by Aparna Gollapudi. Reviewed by Tiffany Potter. Adapting King Lear for the Stage by Lynne Bradley. Reviewed by Linda Bensel-Meyers. Stuart Women Playwrights, 1613-1713 by Pilar Cuder-Dominguez; Teaching British Women Playwrights of the Restoration and Eighteenth Century England edited by Bonnie Nelson and Catherine Burroughs. Reviewed by Aleksondra Hultquist. Of Love and War: The Political Voice in the Early Plays of Aphra Behn by Judy A. Hayden. Reviewed by Emma L.E. Rees. Dangerous Women, Libertine Epicures, and the Rise of Sensibility, 1670-1730 by Laura Linker. Reviewed by Loring Pfeiffer. Music and Musicians on the London Stage, 1695-1705 by Kathryn Lowerre. Reviewed by James A. Winn. The Rival Widows, or Fair Libertine (1735) edited by Tiffany Potter. Reviewed by Aparna Gollapudi. by Adrienne Ward. Reviewed by Michael Burden. “Colonial Discourse in Richard Cumberland’s Play The West Indian: The Relationship of the Colonizer to the Homeland” by James N. Houston, Jr.
Robert Fahrner’s The Theatre Career of Charles Dibdin the Elder, reviewed by Philip H. Highfill, Jr.
“The Source of Aphra Behn’s The Widow Ranter” by Charles L. Batten, Jr.
“The London Stage Information Bank” by Ben R. Schneider, Jr.
“Rich’s Inventory of Covent Garden Properties (Cont. )” by Philip H. Highfill, Jr.
“Rich’s 1844 Inventory of Covent Garden Properties” by Philip H. Highfill, Jr.
“Milton’s Samson Agonistes: A Checklist of Criticism” by Carl J. Stratman, C.S.V. “Theses and Dissertations in Restoration and 18th Century Theatre” by Carl Stratman J., C. S. V.
“Comparative Drama in the 17th Century” by Robert W. Simmons, Jr.
A Biographical Dictionary of Performers, 1660-1801 by Philip H. Highfill, Jr.